Raman spectroscopy is particularly suited for the study of biosignatures: it is able to detect both organic and mineral phases, is very sensitive to carbonaceous matter and biogenic pigments, and can be used in the field and for space exploration. Thus, in a few decades it has become a key method in (micro-)palaeontology, geomicrobiology and astrobiology. 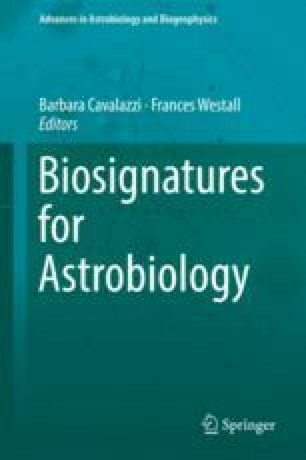 In this chapter, we present an overview of the different types of biosignatures that can be detected and/or characterized using Raman spectroscopy: organic molecules, microfossils, biominerals or even living cells. A particular focus is made on the role of the excitation laser wavelength on the type of biosignatures that can be studied. I thank the Centre National d’Etudes Spatiales for funding. I thank Frances Westall and Keyron Hickman-Lewis for their useful comments.